Not everyone has the perfect garden space in which to build the perfect garden. We would all love a garden that has a combination of sunshine and shade but some of us get all of one and none of the other. For those with too much sun simply building a structure for shade is all that is needed. For those with not enough sun the solution is not as straight forward; for you guys the easiest solution is to cultivate shade plants that require very little sunlight. With the explosion is high rise buildings and expanding neighborhoods many plant lovers have found that the sunlight to their beloved gardens becomes swallowed up in overhanging concrete and steel. For others their sun problem is somewhat self-imposed. Planting trees in your garden is popular, for obvious reasons, and brings with it many benefits such as shaded cool areas on the hottest summer days and dry solitude in the wet winters. However, having fully grown trees, especially several evergreen ones, brings with it its own problems – namely the shade that makes it difficult to grow flowers and plants in large areas of your garden. Many new gardeners fail to realise that when they plant trees in their gardens, from either seed, cuttings or containers the landscape of their garden will change over time; the flowers and plants you currently have in the area around your new trees may become unsustainable when the trees mature. Although there are a several reasons for changing plants located near trees (such as planting ones that will not compete for resources with your newly planted young tree) one of the most important reasons is the amount of the shade that will be created as your trees mature. So, even at an early stage of growth consider which shade plants you will want to grow once your trees start blocking direct sunlight from that area of your garden. As more trees mature, some of your existing plants may find it difficult to thrive in the newly created shade and sun-loving plants will certainly not perform well. The good news is that there are plants that will thrive in areas with less light while offering the same aesthetic pleasure. There are varieties of plants which will not only tolerate low light but that actively thrive in such environments. Before choosing the type of plants you want for your shaded area it is important to take into consideration seasonal changes and how they affect your chosen area. The position of the sun is important when making shade gardening decisions. The degree of the shade in any given landscape changes with the seasons. Areas that lie in full sunlight during the summer may experience some shade during the spring and fall and vice versa. At any given time the sun may be at an angle where the amount of light received may not be sufficient for the plants growing in that area. Some gardeners leave different areas for summer growth and adjoining areas for winter growth and this can be very effective but does require some attention and cultivation. Even though there are many plants that can thrive in shade it is important to realise that shade gardening does require a little more of a hands-on approach than other forms of gardening. Due to the variation in the amount of sunlight received it is necessary to carry-out selected pruning to help reduce resource loss and to maximize the amount of sunlight that is received; diseased and dead plants, leaves and other debris should be removed to not only help preserve the beauty of your compound but to also increase the amount of light available to the healthy plants to sustain plant growth. You can also increase the amount of light by painting and obstacles in bright white, such as a fence, brick wall or a side of a building that is causing the shade house and blocking the light. Other light reflecting colours can also be used but white will reflect the most amount of sunlight back into your shaded area. Some gardeners use mirrors to reflect light back like this one from Amazon but be careful not to point a mirror directly at the plants as you can burn them. Roots competing for resources is an important consideration in shade gardening. There are plants that thrive best in low moisture shaded conditions while there are a number that require moist shade. As mentioned earlier there can resource competition between plants and this is a very important factor that should be considered when planting young trees as they need care and attention for the first 6 months to 1 year. So when designing your shade garden take into consideration the varying amount of light it receives, the seasonal differences and then choose the colors and scents you want in that location. You can always create the type of garden you want when you know what your requirements are as there are visually (colour wise) similar flowing plants and similar scents that thrive in your individual areas. The plant height differences long with the texture of your plants are also important elements you must factor in your plans. The type of plants you want to grow is also a key consideration. We have those that thrive well in shades and which have textural contrasts, different colours and different aromas. Take advantage of such plants if you want to have a variety. Be sure to take advantage of the contrasts that shade plants offer. You are not restricted in your choices just because your garden area gets limited direct sunlight. Consider integrating the dwarfs and the uprights with weeping plants so the landscape is not dominated with the upright and/or ground hugging plants. Mix it up. Consider plants with Glossy leaves as they will reflect what little light the area gets and also have a high impact on any duller tones present. You are not restricted in regards colour or scent just because you have to plant in shade. There are a variety of different plants and once you have a vision of how you want your shaded area to look it is easy to find plants and flowers that can fulfill that vision. The Siberian bugloss, Brunnera macrophylla, and the hosta varieties are some examples of shade plants that can offer vibrant colour and contrast. Of course you can go beyond hostas for a more vibrant look. But be sure to also add soft smooth colours. Also consider incorporating red-leafed plants or the the beautiful cool chocolate ruffles plant. Chocolate ruffles are considered by professional gardeners to be a great way to contrast the common green leafed plants that are so often found in shaded areas. As a rule-of-thumb you will want to avoid darker coloured plants but you can make an exception with the chocolate ruffle. Although the chocolate ruffle is dark in colour it compliments a shaded area especially if it is nested between other vibrant colours. Medium lilac in colour the Amethyst flower offers a nice blue withoutr being too dark to be lost in the shade. The beautiful amethyst flower has a star-shaped bloom of lilac blue, sky-blue or white. They look exceptional good in low level containers or hanging baskets in areas that are shaded but warm. A fern-like plant that offers a variety of colours in any shaded area with moist soil. The warm green foliage bursts into life with tiny blooms of pink, white or red. As well as offering the above different colours there are different varieties that come in varying sizes with bloom times from late spring to late summer. An excellent shaded plant for seasonal variety. 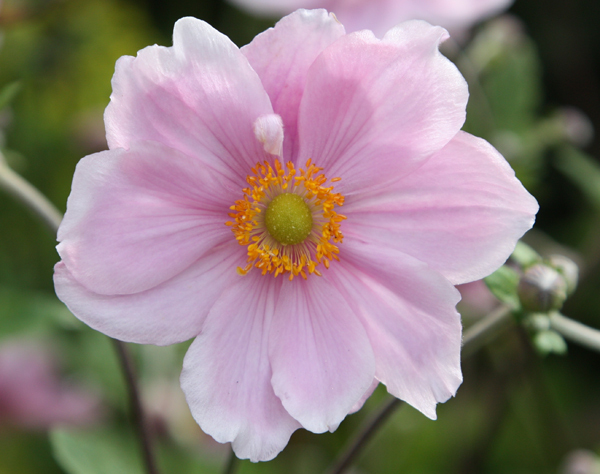 The Japanese Anemone produces single petaled flowers. They come in white with yellow stamens in the center and can be tinged with pink on the underside of each petal. However, they also come in a warm pink. The plant can grow to a height of 3 feet with glossy green foliage that can stand-out well in shaded areas. It won;t do well in moist soil in the winter months and for this reason it may be preferable to plant in separate containers or hanging baskets. Begonia are perennials that grow well in shade while offering beautiful vibrant colours. Although they grow very well in shaded areas they do require rich, moist soil. They come in a variety of colours such as pink, yellow, white and even white with pink fringes. In areas where you want good ground cover but would also like a dash of colour beyond the normal green then carpet bugle is an ideal plant. It is a great way to fill in a large area of ground without having to rely on the usual greenery. You can plant this along with the English Ivy, winter-creeper for better ground cover or even the herb sweet woodruff. The purple dragon dead nettle can offer additional ground cover. It originates in the temperate Asian regions in shaded woodland areas with rich, moist soil. Its white leaves have a green fringe that gives it a christmas-like look that gives the ground in shaded areas a beautiful bright look. The small purple flower offers some colour. Crocus is a vibrant flower that is a shade tolerant perennial. With its goblet-shaped bloom that comes in bright colours with contrasting central stems this flower will grow well in any shaded garden area. A variety of colours are available and they look exceptionally well when planted together. There are a wide variety of shade-loving plants and you should research different types to see which ones best suit your particular needs. However, you should also be aware of your soil type before planting as there are ones that prefer moist soil and ones that are best grown in dry conditions. For a more comprehensive list of the particular shade-loving plants based on the best soil types visit www.thompson-morgan.com. Of course you are not restricted to flowering plants just because you have to grow in a shaded area. You can grow many edible plants in shaded areas such as herbs and vegetables. If your garden area is constantly in have only 3 hours of sun or patchy shade you can grow vegetables such as broccoli, cauliflower, brussels sprouts and even peas. Many root vegetables can also be grown in the shade. They will not grow to the same size as they would in a sunny area but taste great as baby vegetables. “Baby” Radishes and “baby” beets along with “small” onions and “small” garlic and baby carrots can be easy to grow in shaded areas. Many berries also grow well in shaded area and offer not just contrasting colours but also a tasty treat. Some of the varieties you may have to think of include arrowood, serviceberry, leather leaf viburnums, Burk wood, cranberry, dogwood, euonymus and Oregon. These plants naturally grow wild in forested areas where vast canopies of tree leaves block out direct sunlight. You can plant these berries in yards or gardens where light and space are limited. Avoid night-time shades such as purple and deep blue. Although these colours add great contrast and look amazing in a sunny garden they tend to easily recede in the shade. If you do decide to go with darker colours be sure to plant some vibrant, loud perennials for a contrast in colors. For example if you choose to plant European lily bells, you will get better results if you combine them with the perennial foxglove.